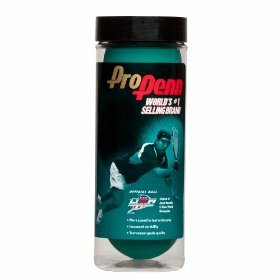 The Official Ball of USA Racquetball makes the Pro Penn the most widely used ball in US tournament play. The Pro Penn ball is also the Official Ball of the International Racquetball Federation making it an International favorite as well. The bright green color has great on-court visibility and the consistent speed, playability and durability make Pro Penn the choice of players who know "The Ball Matters" WORLDWIDE!